When I’m told only I can save the human race from extinction, it’s clear my freeze didn’t avoid a dreadful fate. It only delayed the horror. If you were faced with a situation in which your self-sacrifice meant the difference between life and death, is it your moral obligation/duty to preserve life no matter the cost to yourself? 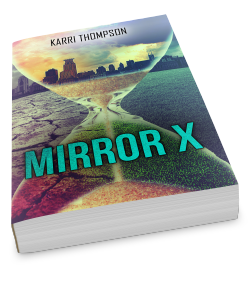 Such is the question introduced in Karri Thompson’s futuristic dystopian novel, Mirror X, and it’s an intriguing premise and conundrum that she presents as Cassie is awoken, after almost a millennia in stasis, to a world as distressingly unfamiliar as it is familiar. 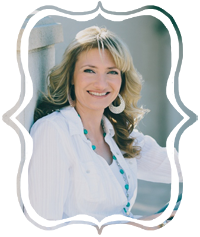 Cassie is given the best medical care available as she eases back into conscious life; the staff and doctors are kind, welcoming and concerned with her recovery and reintegration. But as Cassie learns more about the world as it is now, she soon learns that her awakening wasn’t born of some benevolent intention, nor was it without expectations or strings. She was awoken for a distinct purpose. Story. The premise of Mirror X and the potential for a lot of interesting ethical and moral dilemmas initially drew me to this story. But the long and the short of it is that I’m not sure the concept has been executed as well as it could have been due to Cassie’s character development and due to the fact that the romance has more of a prevalent role in this story than it probably should have. (I’ll talk more about those things later.) It is also weirdly paced in spots, there are some glaring editing errors, and the ending is oddly rushed. However, there are some incredibly interesting and gutsy twists and turns that Thompson introduces into her story that ultimately kept me hooked and wondering how Cassie’s story was going to all play out. World. It’s an interesting world that Thompson creates in Mirror X. It’s now one thousand years in the future, and while many things have changed, it’s surprising (and not surprising) how much things stay the same (re: human nature). A lot has happened while Cassie’s been asleep. The world is scarred and struggling. It’s a world with neat sci-fi elements and dystopian undertones, and it’s one that Thompson establishes and maintains relatively well. Cassie. So many things happen to this heroine in such a short period of time. Her situation progressively becomes more and more horrifying and heartbreaking, and it’s one that I could greatly sympathize with. Thompson does a great job of conveying the desperation and sheer awfulness of Cassie’s circumstances. Cassie is admirably spunky, independent, passionate and surprisingly resilient, BUT despite these qualities and her pitiable situation, I found it very hard to connect with her. So many soul-crushing things happen to Cassie, and her emotional processing at times seems stunted and undeveloped. Everyone processes trauma differently, sure, but some of her reactions to events are at times strange and off-putting. Personally, if I had just been awoken to find out all of my friends and family were long dead and gone, my world unrecognizable, my dreams no longer possible, I doubt I’d be noticing my doctor’s broad shoulders, his cologne or registering his eye color. But, overactive hormones aside (I mean, they have been dormant for quite awhile), I do appreciate where Cassie ends up as a character, and she does undergo quite the journey to get there. Women. I wish this book had developed stronger female characters. For a story that aggressively tackles women’s issues, the women involved seemed largely ineffectual, considered to be lacking by society at larger, considering themselves lacking, and therefore operating in the world under that assumption. There were great female characters — Dr. Love, Ella, Kale — who could’ve been more thoroughly developed. Female characters with who Cassie could’ve made strong and meaningful connections given the subject matter; relationships that could’ve made this story more powerful and poignant. However, it never really happened, in my opinion, because of the emphasis on the romance. Maybe in the next book? Overall. Yes, Mirror X and I had a few issues, but ultimately, when I asked myself, “So, Self, would you pick up book two?” The answer is… yes. Despite my list of grievances, this series still has potential, and I’m still intrigued by the world, the interesting dilemmas, the risks Thompson took with the story, and where Cassie eventually ended in her development in this book. I would like to know what happens next in her story. This looks like an interesting read. Ty for hosting! Cryogenics totally creeps me out! I wouldn’t want to wake up 1000 years in the future. It might be cool at first but more than likely terrifying! sounds interesting. added to tbr list!